General Motors Co. will spend $336 million so its Detroit-Hamtramck assembly plant can produce the Chevrolet Volt hybrid electric car starting late next year. GM is converting the plant's single line, which currently produces the Cadillac DTS and Buick Lucerne sedans, to also build the Volt. Pilot production will begin in March and regular production in late 2010, the company said. GM previously had announced investments of $364 million at seven other Michigan sites for Volt production, bringing total capital expenditures to $700 million for the two-seater hybrid project. “This plant is the hub for the wheel that we got rolling for the Volt in January 2007,” Jon Lauckner, GM global product planning boss, said today at a ceremony at the plant. Detroit-Hamtramck is currently running on a single shift at reduced line speed making the DTS and Lucerne. Production fell from 85,000 units in 2008 to 33,000 in the first 11 months this year. Chevy Volt assembly begins in Detroit next spring. Detroit-Hamtramck will close next week until February to modify the line so it can handle the Volt, which is built on a much smaller platform than the DTS/Lucerne. 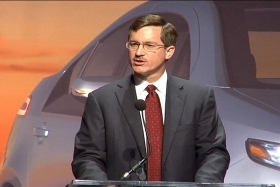 Training the plant's employees to build the Volt will take place in January and February, a GM spokesman said. But the Allante was built on a small, separate assembly line on the west side of the plant, while the Volt will share a line with the DTS and Lucerne.